If your order weighs less than 13 ounces, save huge on shipping with USPS first class (with tracking number). This product weighs 2.2 oz. Hypericin and hyperforin, two key constituents of St. John’s Wort, both promote emotional balance and a sense of well being, as well as encouraging positivity and healthy motivation. Nature’s Sunshine time release formula allows the body to experience a consistent supply of St. John’s Wort, helping to maintain emotional balance throughout the day. 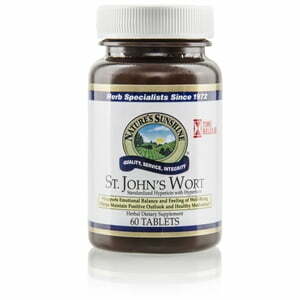 Each capsule is 450 mg of St. John’s Wort extract powder. 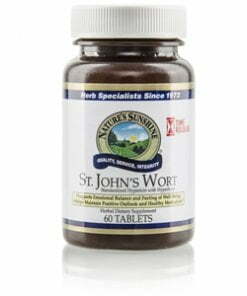 CAUTION: Avoid exposure to strong sunshine, tanning rays, or tanning salons when taking St. John’s Wort. Sunglasses are encouraged when exposure to sunlight is necessary. Persons taking prescription antidepressive drugs including selective serotonin uptake inhibitors and MAO inhibitors should consult their health care providers before taking St. John’s Wort. Instructions: Take one tablet in the morning and one in the evening with water for all-day, all-night support. Cellulose (plant fiber), dicalcium phosphate, stearic acid (vegetable), and magnesium stearate (vegetable).